The MEI Renaissance Singers, is like a "Junior Chamber Singers" of approximately 20 singers in all grades (9-12) who want to be challenged in a choir with a less demanding schedule, OR for students wanting to hone their skills to prepare for a future audition for the MEI Chamber Singers. Rehearsals happen one to two mornings per week and students receive a 1 credit course on their transcript. The performance schedule has usually included some Christmas Concerts, a couple of spring performances and a fantastic spring weekend trip to a festival in second semester. The choir looks forward to this annual weekend music trip and in the past they have gone on trips to the Whistler Music Festival, the Nelson Music Festival, and down to Seattle. Last year the Renaissance Singers spent a beautiful sunny weekend at the Sun Peaks Music Festival in April. This year the choir is looking forward to performing at the West Coast Christmas Show at the Tradex in Abbotsford (Nov. 22), at the Sevenoaks Shopping Centre and at the annual MEI Christmas Concert (Dec. 17). The MEI Chamber Singers is the most requested and busiest choir at MEI. 18 of MEI's best singers become a team of incredible talent as they rehearse two mornings per week and often have a demanding concert schedule. You may have seen them entertaining locally at various food bank events or on City TV Breakfast Television. This year's group is looking forward to performing with “Tenore”, Canada’s newest up and coming tenor trio, on December 11 in Abbotsford, as well as competing at the World Strides Festival of Gold in Washington, D.C. (April 2014). Recent groups of MEI Chamber Singers have won Superior and Gold awards at many local, national and international choral festivals including the prestigious, invitational Festival of Gold series, winning top Chamber Choir in Chicago (2012). They have performed across North America, including recent trips to Anaheim, New York, and on a cruise ship to Mexico. The music department together, which includes the MEI Concert Choir, MEI Concert Band, MEI Jazz Band (Razzberry Jam) and the MEI Chamber Singers/Jazz Choir has won many accolades as the overall top music program at many of these festivals. With their jazz choir hats on, the Chamber Singers have won many awards at the Lionel Hampton International Jazz Festival, including numerous trophies for "Outstanding 'A' Choir; as well as at the BC Interior Jazz Festival and Surrey Jazz Festival. The group has been honoured to perform alongside many celebrities in the BC Variety Club Telethon and performed at GM Place in Vancouver, alongside internationally acclaimed performing artist, Josh Groban, on his hit song "You Raise Me Up" (2004). The singers have been excited to perform the national anthems at many Vancouver Canucks games, a Vancouver Grizzlies game, and Seattle Mariners and LA Dodgers baseball games. They have made local splashes in 8 annual appearances on the MEI Float, singing and waving to over 300,000 parade watchers that attend the Roger's Santa Claus Parade in downtown Vancouver, as well as appearing on City TV's Breakfast Television every year. Look for them again this year on the parade float or making special appearances on TV. The MEI Concert Choir is is an auditioned choir of up to 50+ voices from the Mennonite Educational Institute Secondary School in Abbotsford, BC. The MEI Concert Choir sings a wide range of top quality choral literature, specializing in a cappella singing. Comprised of grade 11 and 12 students the choir has toured many places in Canada and the USA. The MEI Concert Choir has enjoyed incredible success over many years through a variety of performance venues. They have received Superior and Gold awards from regional and national festivals, delighted audiences in many Christmas concerts, and served in numerous local church ministries. The choir is right at the beginning of another busy season that will again feature many Christmas performances, including a spectacular concert with Tenore and our annual MEI Christmas Concert. The Concert Choir has often performed in the prestigious, invitational Festival of Gold series, including Chicago, New York and Anaheim and this year will performing in the Festival of Gold in Washington, D.C. Last spring the MEI Concert Choir finished the year with a great weekend in Sun Peaks, and their annual tours have taken them to Chicago, New York City, where the Concert Choir won Gold at the Heritage Music Festival, as well as an Adjudicator’s Award for high choral score and was a part of winning the overall Festival Sweepstakes award as the top music program at the Festival, including the MEI Chamber Choir, Concert Band, and Jazz Band (Razzberry Jam). The Anaheim festival included performances on a Royal Caribbean cruise ship and in every port enroute to Ensenada, Mexico. In 2007 the choir was very honoured to sing with Canada’s popular tenor act, the Tenors, and are looking forward to performing with Tenore, Canada's newest tenor trio, for the third time, in Dec. 2013. In the past the choir has also been honoured to perform at Robert Schuller’s Crystal Cathedral and at the spectacular "Christmas at the Chan" concert with Trinity Western University's choirs and orchestra. 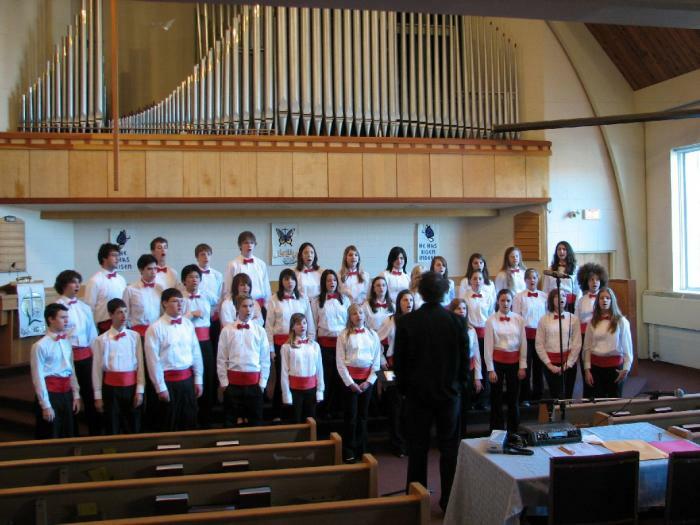 The MEI Junior Chorale is the grade 10 choir class in the music program at MEI Secondary School (Mennonite Educational Institute) in Abbotsford, BC. The Junior Chorale is open to any grade 10 student, with no pre-requisites, and acts as a preparatory choir, developing voices for future membership in the MEI Concert Choir in grades 11 and 12. The choir has been very successful in past years at local festivals and a variety of performances and church ministry engagements. The Junior Chorale, along with other choirs, puts significant preparation in the annual MEI Christmas Concert and Spring Choral Concert.